Welcome to the Wikitude SDK. 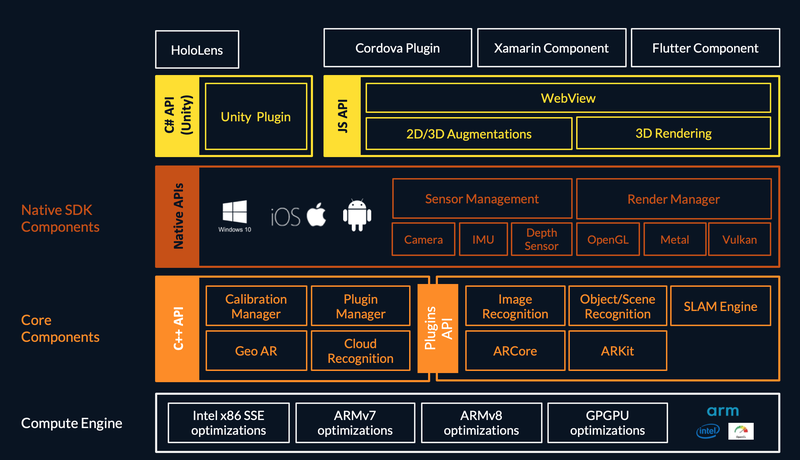 This document is designed to help you from your very first steps with the Wikitude SDK all the way through to advanced concepts and examples for developing your augmented reality project. The documentation is arranged in a way to guide you through the various steps in your development process. We recommend following each of the steps outlined below and reading the documentation in the order displayed. In this section we describe the necessary setup of the Wikitude SDK using the Cordova Plugin in a step-by-step guide. All of the included samples are complete augmented reality experiences which run in SDKExamples app. Browse through this section and get an idea of what the SDK is capable of. The relevant parts of the samples are described in more detail to highlight the applied concepts and patterns. These examples are designed to help you get off to a great start with the Wikitude SDK. Viewing samples based on vision based augmented reality requires the corresponding reference images. All of them are available directly in the description of the sample or available as a collection on this page, which you can either view on the screen or print. This section will introduce you to best practices for your development workflow once you write your own code for your augmented reality experience. The Wikitude SDK is a software library and framework for mobile apps used to create augmented reality experiences. The SDK supports any kind of location based use case as well as use cases which require image recognition and tracking technology (vision based augmented reality). Wikitude SDK - Native API: Provides access to the Wikitude computer vision engine natively for Android (Java), iOS (ObjC) and Windows UWP. It also can load plugins via the Wikitude Plugins API. Wikitude SDK - Unity3D Plugin: On top of the Native API the Unity plugin allows to use the Wikitude SDK in combination with Unity. Integrating the Wikitude SDK into your application is done by adding the platform specific view component called ARchitectView to your applications user interface. See the setup guide for how to setup projects and load an ARchitect World. Get started with writing augmented reality experiences by browsing through the examples included in the SDK package. Each example is explained in detail in this documentation. Additional information about the ARchitect API can be found in the included API specification. The Wikitude Developer Section should be your first stop when you have specific development related questions. The portal hosts a very active Developer Community Forum where Wikitude staff members are constantly assisting other developers with helpful tips and advice. You can find How-To's and a constantly evolving FAQ section there as well. We are always interested in your feedback and suggestions how we can improve this documentation. Please use the contact form on our website or visit us on Linkedin, Facebook or Twitter.